The midfielder was injured in the defeat to St Mirren on Saturday. Kilmarnock midfielder Sammy Clingan is set to miss the next six weeks with a knee injury, STV understands. 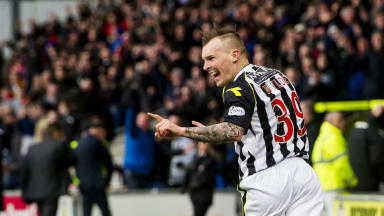 The 30-year-old had to leave the field after 26 minutes of Saturday’s 2-0 defeat to St Mirren in Paisley. And after undergoing scans the player is unlikely to play again until after the Scottish Premiership split. Clingan pulled out of Northern Ireland’s squad to face Cyprus on Wednesday and will now miss the pre-split matches against Hearts, Celtic, Aberdeen, Motherwell and St Johnstone. The former Coventry and Doncaster player has scored once in 16 appearances for the Ayrshire side this season. Clingan joined Kilmarnock in January 2013 under previous manager Kenny Shiels.